Who was the Best Sparx? He's ok but he was a little too sarcastic in the game. One part of it is when you go against the Ice King and his scream was not very realistic. Just my opinion. Hm, if you mean the Legend series, then I like Billy West the best, he was the one for TEN. I like his little buzzing voice from the classics! I, too, am fond of Billy West's Sparx. He put a lot of life in the character and made badly written script lines funnier than they would have been without him. David Spade takes the cake, man. He does great at every voice he does. From Emperor Kusko (Did I spell that right?) to Sparx, he's great. The other Sparx voice actor/s after were nothing compared to him. David Spade, then Billy West. I didn't like the last voice actor. David Spade: Best Sparx EVER. In TEN and DoTD he wasn't as funny. The only funny line he spouted in DoTD was "Let's blow this dam thign up!" and even then it wasn't extremely funny. David fit Sparx's part well. ↑ I agree with everything you said. ^ I agree with the above two posts. Although I don't think Dawn Sparx is bad... Just extremely bland like a lot of the other Dawn characterisations, unfortunately. He's probably the best character in Beginning and Night. Alot of people on Youtube say Sparx's Dawn of the Dragon voice was best. 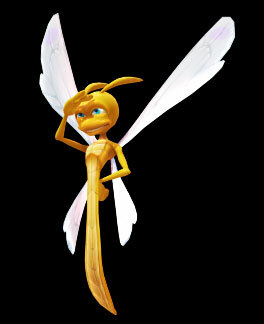 whoever voiced the non-talking insomniac sparx, then the hero's tail one (jess harnel? ), then billy west. faun didn't really care for david spade or wayne brady (though brady was more tolerable than spade, if only for saying nothing but surreal nonsense for the entire game). I was mixed. Hearing Sparx speak was a little awkward, but David Spade did a good job and gave Sparx some personality. Billy West? Not so much. Wayne Brady? I don't know what they were thinking with that choice, but he didn't really say much, so I can't complain. "Your mother was a broken down tub of junk with more gentleman callers than the operator." I like David Spade's Sparx voice the best. I didn't really care for his Dawn of the Dragon voice quit as much, and Billy West's voice was just "ok" for him...but that is just my opinion. And I didn't realize he was the one who played Emperor Kuzco's voice, Ash! I love that movie. EDIT: Actually, now that I am starting to play the ETN once again (it has been forever since I have), I have to say that I actually may like Billy West's voice the best of the three. It suits Spark, in my opinion. Plus he is too doggone funny throughout the three games (not quite as much in DotD in my opinion, though)! i honestly think that this is problably the BEST voice for sparx. I knew they would change it in Dawn of the Dragon, but why make it someone COMPLETELY different? Why not just ask David Spade to talk in a slightly lower voice? I brake for rainbows; carmageddon reincarnation! woo!